Building on the efforts of the Laboratories for the 21st Century (Labs21®) Program, I2SL is working hard in 2013 to continue advancing the knowledge and resources available to the laboratory and high-technology facility industry. As a member of this industry, you play a significant role in this endeavor. 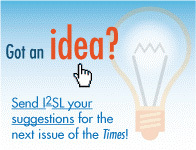 I invite you to get involved with I2SL's efforts, whether you would like to submit an article to our E-Library; join the Global Community and promote your organization alongside our newest Providers, Consolidated Sterilizer Systems and STERIS Life Sciences; participate in and/or lead one of I2SL's numerous training opportunities throughout the year; speak at the upcoming 2013 I2SL Annual Conference (formerly the Labs21 Annual Conference); or help develop industry-relevant tools and resources. Read on to learn more about these activities and how you can participate. I look forward to working with many of you to make 2013 a great year for the sustainable, high-tech building industry. The ANSI/AIHA Z9.5 Laboratory Ventilation Standard has been a staple of the laboratory community for a decade. Recently, AIHA published an update to this standard: ANSI/AIHA Z9.5-2012. According to Gordon Sharp, President of Aircuity, Inc. and Executive Vice President of I2SL, the change in the fume hood minimum airflow recommendations is one of the more substantive changes relating to laboratory sustainability featured in the new standard. Visit the AIHA website for more information or to purchase a copy of the standard. Purdue University in West Lafayette, Indiana, needed to expand the computing capacity of its Rosen Center for Advanced Computing. However, the existing facility could not handle the increased cooling requirements, and the university lacked the budget to construct a new data center. Published in the January 2013 issue of Mission Critical Magazine, this case study highlights the innovative efforts by the university to reach its desired computing capacity simply by upgrading its existing equipment and infrastructure. In December 2012, the U.S. Department of Energy's (DOE's) Federal Energy Management Program (FEMP) released a two-page fact sheet, Sell Energy-Efficient Products, to help manufacturers and vendors explore the federal market. Monitoring is an essential component of maintaining data center energy efficiency; however, these assessments can sometimes be both time and cost-intensive. This guide, published by FEMP in October 2012, introduces a data center assessment kit that can be used to speed up and reduce the costs of a data center energy use assessment and overcome potential shutdown issues. I2SL and DOE's FEMP are finalizing a Memorandum of Understanding (MOU). The MOU establishes a formal relationship between the parties that will address common interests and challenges for the laboratory and other high-tech building sectors. Kicking off the partnership, I2SL and FEMP will collaborate on facilitating strategies that expand energy service company (ESCO)- and utility-financed energy efficiency projects in both federal and privately owned high-tech facilities. One such effort is a call for case studies on third-party financing, which you can read more about below. I2SL looks forward to working with FEMP and will keep you posted on these efforts as they develop. 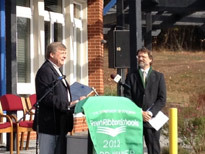 Phil Wirdzek (left) presents a 2012 Go Beyond Award to Dr. Kevin Bezy, principal of The Gereau Center. In November 2012, I2SL President and Executive Director Phil Wirdzek traveled to Rocky Mount, Virginia, to attend an awards ceremony at The Leonard A. Gereau Center for Applied and Career Exploration. There, Mr. Wirdzek presented the center with its 2012 Go Beyond Organizational and New Construction Project awards for its innovative and sustainable Center for Energy Efficient Design (CEED). When the U.S. Environmental Protection Agency (EPA) and DOE launched the Labs21 Program in 1999, the agencies invited a group of volunteer laboratory owners to enhance their facilities' environmental performance using the design and engineering strategies identified through Labs21. One of the early adopters of this Labs21 Pilot Partner Program was The Gereau Center. Now, nearly two decades later, The Gereau Center has truly "gone beyond" the original goals of Labs21, particularly with CEED. This net-zero energy, LEED Platinum laboratory allows students to observe energy engineering firsthand and to design and execute their own energy-related experiments. The center is neither a typical school nor a high-tech research laboratory; it is a high-tech "living laboratory" where students are educated by the facility itself. Learn more about The Gereau Center by reading A School Beyond the Box (article found on page 24), which was published in the February issue of Lab Design Newsletter. Energized by meetings that took place at the Labs21 2012 Annual Conference, the I2SL Working Groups have been running full steam ahead on a variety of projects. Here are just a few highlights of their recent activities. This Working Group met on January 25, 2013, to further discuss a survey it is developing to gather information about the need for high-tech facility technician training and certification. The Working Group plans to finalize and broadly release the survey in the coming weeks. Laney College, which co-chairs the Working Group, was successful in receiving a National Science Foundation "Centers" grant for its HVAC training program. The college is looking to use this grant to expand its O&M training for high-tech facilities. As a follow up to their meeting at the Labs21 2012 Annual Conference, nearly two dozen members of this newly formed I2SL Working Group held calls in January and February to discuss next steps for developing a continuous performance improvement system. Three sub-committees are now working to address metering, behavior, existing standards and guidance, and how to integrate these items in the system. The Working Group is being led by Mike Austin of the University of Minnesota. In January 2013, Igor Starkov and Terence Alcorn presented the results of the BIM for Facility Management survey during an I2SL High-Tech Talk Webinar. The survey, which was launched last year by I2SL, in partnership with the National Institute for Building Sciences (NIBS), the buildingSMART alliance (bSa), and the International Facility Management Association (IFMA), collected information on the interest for and knowledge of how BIM is impacting the work of facility managers and O&M professionals today, and where BIM may lead the industry tomorrow. A recording of this webinar is available for viewing on I2SL's website (fees may apply). I2SL and several other GSLN members traveled to Bilbao, Spain, last November for The World of Sustainable Laboratory (WOSLAB) event. While in Spain, Phil Wirdzek of I2SL, Konrad Kreuzer of EGNATON, Adelmo Antelo of the MAITE Foundation, and later James Dykes of Sustainable Labs Canada signed the GSLN Agreement (44 KB, 2 pp) to help support and advance the objectives of the Working Group. Your commitment to and participation in these Working Group activities is important for both the industry and I2SL's continued success. 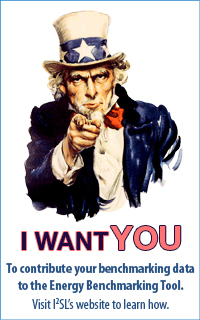 I2SL encourages you to get involved as we continue to develop useful products for this community. All Working Group participants are expected to become I2SL Members. Become a Member today and then email I2SL to let us know of your interest to participate in one or more of these proactive groups. Read about how the University of California, Irvine's, Smart Labs Project increased the energy efficiency of the campus' laboratories by more than 50 percent and reduced its carbon footprint without compromising occupant safety, simply by developing smarter laboratories. Learn how a project team at the Ottawa Heart Institute used an innovative new duct sealing technology to reduce the risk of airborne contamination and lower the building's air loss from 800 cubic feet per minute (cfm) to just 10 cfm without construction or interruption of the facility's daily operations. This new report, published by the S-Lab initiative, identifies best practice and strategic developments in laboratory design, management, and operation. The publication summarizes and draws lessons from presentations and discussions at the 2012 Effective Laboratory conference, and contains case studies of the 28 shortlisted entries for the 2012 S-Lab Awards. Learn more about the facility O&M best practices in place at four prominent high-tech facilities: the Smithsonian Institution in Washington, DC; the Fred Hutchinson Cancer Research Center in Seattle, Washington; the Adobe Systems Headquarters in San Jose, California; and the eBay Data Center in Salt Lake City, Utah. The case studies highlight state-of-the-art technologies, as well as best practices in proactive policies, procedures, and maintenance; communications; planning; and multi-stakeholder collaboration. Laboratory sustainability isn't limited to building energy efficiency and design. 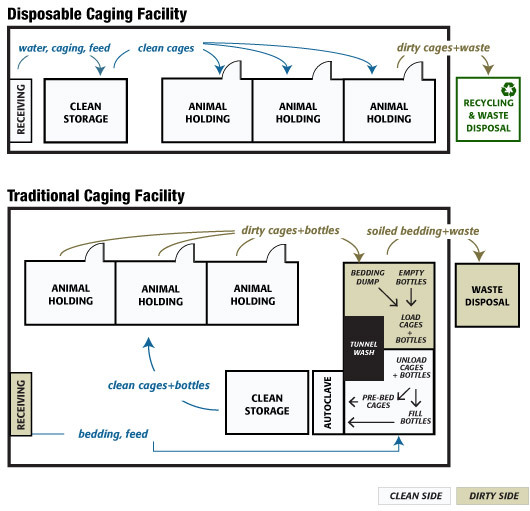 Consider other ways your facility can reduce its environmental impact, like using recyclable cages in your vivarium. Using recyclable cages dramatically reduced the capital expenditure required to build Stanford University's Lorry I. Lokey Stem Cell Research Building, saving more than $4 million by eliminating high throughput washroom equipment and the infrastructure for washroom HVAC. These savings will continue through the reduction in labor and utilities, which are significant in a recyclable caging operation. Additional savings come from reduced management time, reduced detergents, and other supply costs that are incurred to manage and operate a cage wash. Read Case Study: The Lorry I. Lokey Stem Cell Research Building at Stanford University to learn more. Photo courtesy of Innovive Inc. Being a member of I2SL's Global Community offers numerous opportunities to align yourself with like-minded professionals and share your expertise with our growing industry. Find the I2SL Global Community offering that is just right for you or your organization. 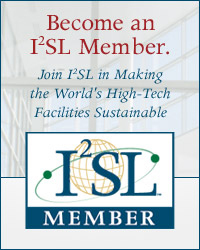 Help develop resources that will guide the high-tech facility community toward creating more sustainable facilities by becoming an I2SL Member. Membership benefits include free registration for upcoming I2SL High-Tech Talk Webinars; free access to the Labs21 2002–2012 Annual Conference Presentations Archive (a newly added benefit! ); recognition on I2SL's Global Community website; the opportunity to start or join an I2SL Chapter; and invitations to serve on Working Groups, review committees, and technical panels. I2SL offers companies an opportunity to take active roles in promoting their expertise to the I2SL community by becoming I2SL Providers. Market your organization through videos or other promotional content linked to from your Global Community Provider listing. I2SL seeks individual leaders and organizations to share in the rewards of creating and promoting more sustainable laboratories and other high-tech facilities worldwide by becoming I2SL Chapters. I2SL Chapters will build regional networks of industry professionals that will meet regularly to share resources and lessons learned, and to address challenges unique to their area. Chapters are currently being planned for Colorado, Illinois, Georgia, and Pennsylvania. Email I2SL to express your interest in helping to form one of these Chapters or starting an I2SL Chapter in your region. Visit I2SL's Global Community website to learn more about these opportunities and to join as a Member, Partner, or Chapter. Have you been involved in a project that successfully used third-party financing, such as an energy savings performance contract (ESPC) or utility energy service contract (UESC), to fund an energy-saving project in a laboratory or high-tech facility? If so, I2SL wants to hear from you! What were the project objectives, and how were you able to meet those objectives using an ESPC or UESC? What are the actual cost and energy savings from the project? Due to a growing interest in this area, especially from the federal government, I2SL hopes to compile a collection of relevant case studies for publishing in its E-Library and highlighting in the Sustainable Laboratory Times newsletter. I2SL is especially interested in case studies that include input from or are co-authored by the facility owner. In addition, I2SL is planning a special meeting with ESCOs and utilities at the 2013 I2SL Annual Conference to explore ways to increase third-party financing for laboratories. Email your case study to I2SL or, if you are interested in presenting your project at the 2013 I2SL Annual Conference, submit an abstract to the Call for Presenters. Reserve your booth on or before May 31, 2013, to save $500. 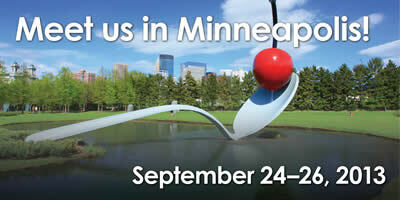 Submit an abstract to the 2013 I2SL Annual Conference Call for Presenters. Abstracts are being accepted now through Friday, March 22, 2013. Submit a nomination for the 2013 Go Beyond Awards. Minneapolis—St. Paul is the 16th largest metropolitan area in the United States and the primary business center between Chicago and Seattle. Minnesota is home to 19 Fortune 500 companies—including Target, Xcel Energy, 3M, and Ameriprise Financial—more than any other state. The University of Minnesota, located in Minneapolis, has the fourth largest enrollment among U.S. public four-year universities. More than a dozen additional institutions of higher education call the Minneapolis—St. Paul area home. The Mayo Clinic, Saint Mary's Hospital, and Rochester Methodist Hospital—located just 90 minutes from Minneapolis—form the largest integrated medical center in the world. Do you have either of the I2SL Annual Conference Widgets posted to your organization's website? If so, please note that I2SL recently updated the HTML code from "labs21_conf" to "I2SL_conf". Please update your HTML codes so the widgets continue to function properly when displayed on your website. I2SL plans to phase out the old widget file paths in June 2013. Visit I2SL's Conference Promotion Web page for more information. Following are just a few of the industry events taking place over the next few months. Sign up for the March 21, 2013, High-Tech Talks Webinar, Sustainable Steam Sterilizers. The 2013 I2SL Annual Conference Call for Presenters closes on March 22, 2013. Be sure to submit your abstract before the deadline! I2SL will start collecting nominations for its Go Beyond Awards in April.